Riderless – 13×19 inch black and white print produced with archival, museum-quality materials. It’s not uncommon to hear people disparage abstract paintings by saying something like “Heck, I could do that!” or “My kid could paint that!” I’m no expert on abstract art, but I see a lot of it I like, and a lot I don’t. I’m not a painter, but at one point I bought some canvases and paints and decided to try my hand at abstract painting. I figured it would be fun, and I might end up with something expressive, or at least interesting. It was really, really hard. I didn’t end up with anything I liked. It made me appreciate people who are good at it. I don’t usually shoot totally abstract photography, although I do like to play with images to make them somewhat more abstract than real life. The lyrics of the song quoted above have stuck with me since I first heard it 20 years ago. The phrase “an experiment in abstract dreams” resonated with me as something I try to do through my photography, with varying success. I shot this image at one of those traveling carnivals that had been set up in a parking lot in my neighborhood. It was chilly, rainy, and windy, and a couple friends and I decided to take our cameras at night and see if ended up with anything interesting. This one was my favorite of the night. Actually, I think it’s only one of two or three that were worth keeping at all. Other than converting to black and white and adjusting some levels, there’s not a lot of post-processing. 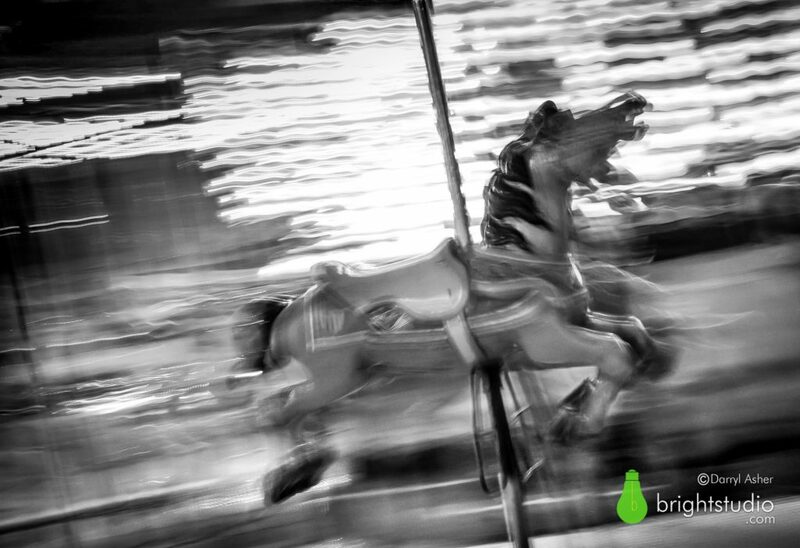 The motion blur was all in camera at the time of exposure, created by shooting hand-held with a slow shutter speed, and panning along with the carousel horse as it flew by. Although not technically an abstract image, I think allows a lot of room for the viewer to bring their own emotions and interpretations into it.